Perhaps made to hold relics of St Valerie, whose martyrdom it commemorates. She was a Roman governor’s daughter who converted to Christianity. She refused to marry her former fiancé after taking a vow of chastity. At her execution she miraculously caught her own severed head and presented it to St Martial (front right and lid). Her executioner was struck dead by God’s avenging arrow (top left). 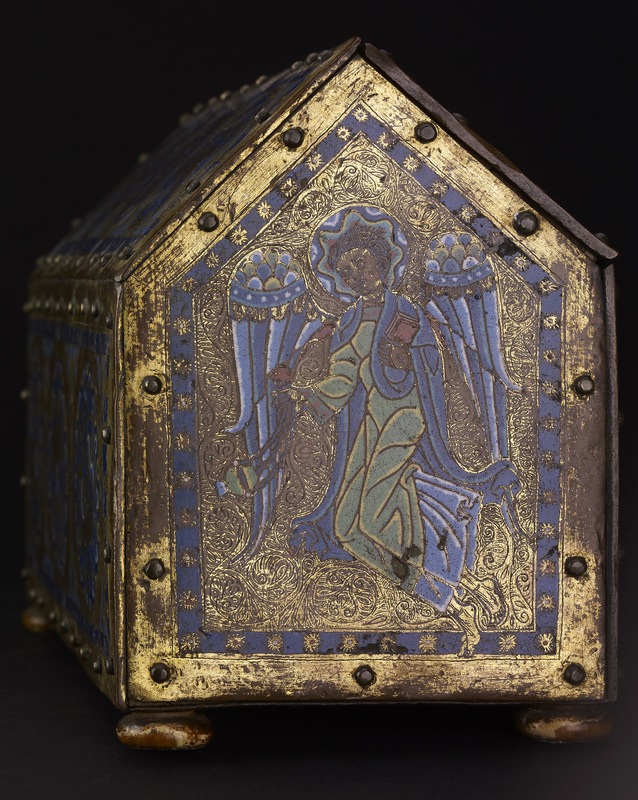 Reliquary; champlevé enamel on copper; gilded and engraved; Martyrdom of St Valérie, patron saint of Limoges; oblong in shape, with gable top; removable front with triple lock; incidents of martyrdom seen on removable lid and on face of casket beneath, partly repetitions; on lid: proconsul Junius Silanus seated holding a sceptre; before him his servant Hortarius, executioner of the saint, struck by lightning while the saint, supported by an angel walks off with her head in her hands; beyond, still supported by angel, she kneels and offers her head to St Martial, who is dressed as a bishop and is celebrating Mass with an assistant; on casket itself the proconsul is seated with a sword-bearer behind him and is giving directions to Hortarius, who is leading the saint off to execution; final scene shows decapitation of witnessed by a crowd in a doorway, while a hand in benediction issues from a cloud over the head of the saint; on each end is an angel censing; on other half of top are four medallions containing two lions and two monstrous birds in gold on a background of light and dark blue enamel; on back of body are three medallions with similar birds on light blue ground; on the two panels of the front and ends, only the figures are enamelled, while the ground is gilded and covered with engraved scrolls; enamel colours are deep and pale blue, apple green and intense red; blue and green have shaded edges. Provenance: Baron Anselm von Rothschild, Vienna, by 1866 (cat no. 1), by inheritance to his son Baron Ferdinand Rothschild (d. 1898). Commentary: St. Valérie was the patron saint of Limoges in France. The orphaned daughter of a Roman prefect, she converted to Christianity pledging her virginity to Christ. The new prefect, Stephen, ordered Valérie's execution when she refused to marry him. On the front, Stephen raises his arm ordering Valérie's beheading. Above, the decapitated Valérie presents her head to St. Martial, the first bishop of Limoges. 'The scenes on the front and lid of this chasse are episodes from the martyrdom of St. Valerie, the patron saint of Limoges. When Valerie, the daughter of the Roman governor of Aquitaine, was executed, her head fell into her lap; miraculously, she presented it to St. Martial (who had previously converted her to Christianity). On the left, the proconsul Junius Silanus condemns Valerie to death as Hortarius the executioner holds the saint by the arm. Her execution takes place on the right, witnessed by a group of spectators clustered in a doorway. On the lid above, the decapitated saint walks, aided by an angel; kneeling at the altar, she offers St. Martial her head. Each of the side panels depicts a brightly enamelled angel, hovering above the ground while holding a censer. The back and corresponding roof panels show birds, lions, and human-headed beasts within medallions. A chasse undoubtedly made by the same Limoges workshop is in the Basilewsky Collection in the Hermitage (inv. no. Ф 175). The style and decoration of the chasse compares closely with that of another casket in the British Museum, (1859,0110.1). O.M. Dalton, 'The Waddesdon Bequest', 2nd edn (rev), British Museum, London, 1927, no.19, pl. IV and 2 figs. Dora Thornton, 'A Rothschild Renaissance: Treasures from the Waddesdon Bequest', British Museum, London, 2015, pp.88-95.